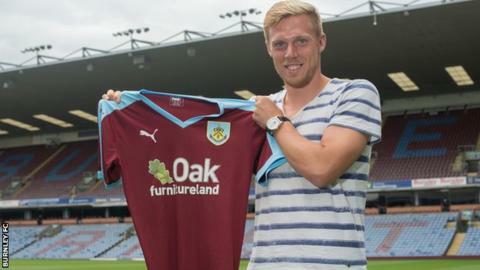 Burnley have signed striker Rouwen Hennings for an undisclosed fee from Bundelisga 2 side Karlsruher on a three-year deal. The 27-year-old German scored 18 goals in 29 appearances last season to finish as top scorer in the division. After starting his career at Hamburg, he also spent time at VfL Osnabrück and St. Pauli. "I am very proud to be part of this club and I hope we have much success together," he told the club website. "I think England, along with Germany, is the best place to play football and for me and my family - it is a great chance to get more experience." He is still awaiting international clearance so is not available for the Clarets' game against Birmingham on Saturday.